Family historians make a note of source references so we (or someone else) can find an item again. There are 3 reasons why you should know the 'Previous System location' for records you use at Queensland State Archives, as well as the newer 'item ID' number. Typos and misinterpretation are less likely with Previous System location numbers. For example, the immigrant file for Agnes Adamson AITKEN is item ID 1111111. Its Previous System location is IMM/5. I know which one I am more likely to get wrong when I read it or write it! Even if there is a typo in a Previous System location number, the letters at the beginning often indicate the agency. With that, it may be possible for you to eventually find the record (perhaps with help from the archivist on duty). For example, IMM means Immigration Department; SCT means Supreme Court; CPS means Court of Petty Sessions; JUS means Justice Department; and so on. 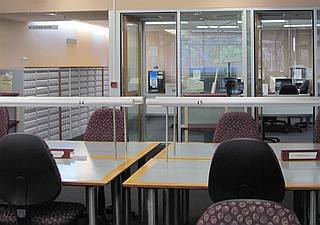 If the computer system crashes while you are in the Public Search Room, staff may be able to retrieve documents from the repository if you can quote the Previous System location, because it often indicates the shelf position. If you only have item ID numbers, you may have to give up and go home. I can always keep working because I know the Previous System locations for records that I've already located in the catalogue. In the Queensland State Archives' catalogue (on the Internet and at the Archives), the 'Item Details' screen shows the Item ID and (if applicable) the Previous System location and Departmental numbers. The latter often point to a specific file in a bundle. From your own experience at Queensland State Archives, what other tips can you share? No research related but my tip - take your carkeys and wallet in with you! If that fire alarm goes you are shepherded out the nearest door and that's that. Hopefully a false alarm (like the one I experienced) but it taught me a lesson when visiting any archive. I had it happen at PRONI and had my passport in my pocket too (mind you, they evacuate you to dockside and it was freezing). Excellent point, Roberta. Queensland State Archives do not allow wallets in the Search Room (as stated in What to Bring) but I go in with all my keys in my pocket, and a credit card and cash in the pouch-on-a-lanyard provided by the Archives. If I'm researching overseas again, I must remember to put my passport in my pocket too! Had never thought of that... good advice, from you both, Roberta and Judy... thank you.